Boomer is a tennis-playing robot. You might imagine a hulking, metal humanoid, lumbering and lurching around the court until it teeters over and breaks down. 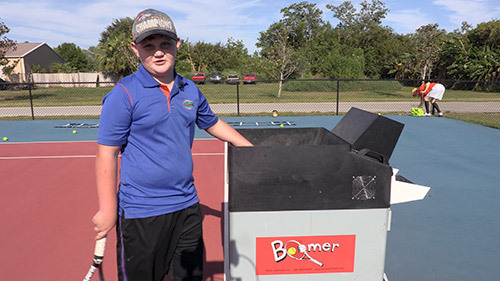 Actually, Boomer is stationary, durable, and conceptually simple–a remarkably clever solution to the challenge of designing a machine that truly plays tennis. 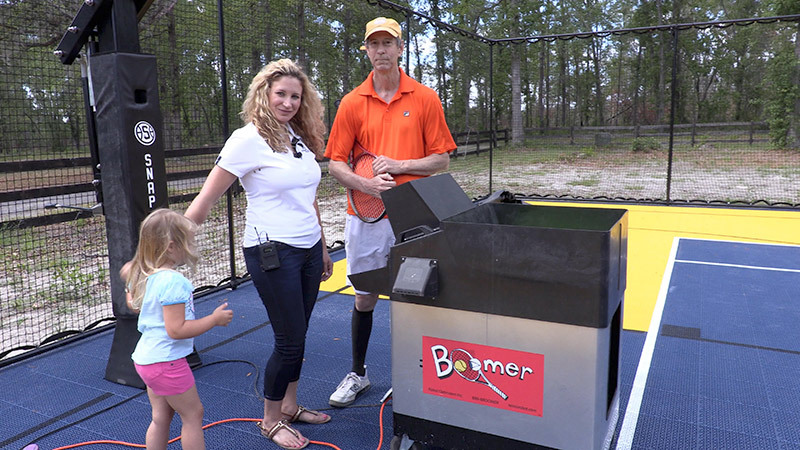 Boomer is a top-of-the-line ball machine, greatly enhanced with souped-up throwing capabilities, a camera, and a computer. The mechanical enhancements enable it to throw a ball at any speed, at any angle, with any spin. The camera, Boomer’s eyes, enables it to see my shots. And the computer, Boomer’s brain, interprets what the camera sees, assesses my shots’ speed and placement, and decides what type of shot to throw in reply. That is, Boomer is an expert tennis-player, with eyes, a brain, and extraordinary “hitting” capabilities. In game mode, Boomer keeps hitting until I miss, or until I win the point with skill, perhaps a shot that’s deep and fast, a 2-shot or 3-shot combination, a deep or angled volley, or some other quality play–or just a prolonged grind. If my shot is in, Boomer hits back; if my shot is out, Boomer calls it out, announces the score, even tosses me balls to serve before each point during my service games, or warns me when it’s about to serve during its service games. 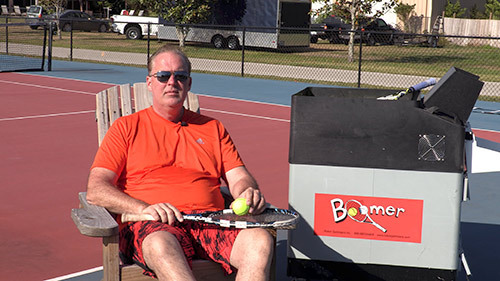 With Boomer, I can play a real game of tennis any time I want, 24/7/365, for as long or as brief a session as I want, with an opponent at any skill level I want. No need to schedule at its convenience, and it NEVER cancels a date to play with me. As you can imagine, the possibilities are innumerable. Suppose I have only 30 minutes to exercise. I could have a quick run or swim, but that’s boring. I love tennis, but I can’t ask someone to come over to play for only 30 minutes. So instead, I play tennis with Boomer for 30 minutes. If I want a more intensive cardio-vascular work-out, I can set Boomer to play games at a higher skill level, or I can just do demanding drills. It’s fun, so I actually do it, instead of running or swimming, which I would just skip. with Boomer at a lower skill level, giving me time and opportunity to implement the new skill. Suppose l just want to play games with a much better player. He might be hard to ﬁnd, because most players don’t want to play with a much weaker opponent. But I can always play games with Boomer after setting it at a higher skill level, as high as I want. After my house, my favorite material possession is my Boomer. You made an extraordinary investment of money and effort to acquire your own tennis court. It makes NO sense not to spend a few more dollars to get the most out of it. I have no ﬁnancial or other interest in Boomer. Boomer is so fun! It plays when you want and at the level you select. – Amy Williams, Jacksonville, FL. drills. It’s fun, so I actually do it, instead of running or swimming, which I would just skip.